At least one person is dead and three others injured after deadly tornadoes tore through parts of Oklahoma on Wednesday. 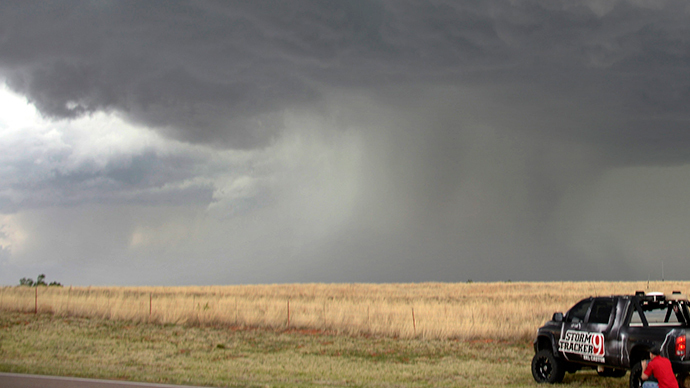 Two twisters were reported, with severe storms and hail also slamming the state. One of the tornadoes originated near Tulsa before shredding through a mobile home park near Sand Springs. One person was killed during the event and several others were injured, with fire departments and rescue workers currently combing through the grounds and seeking any wounded survivors. "Right now, rescue efforts are continuing and officers are aiding the injured and helping those who need immediate medical care," Maj. Shannon Clark of the Tulsa County Sheriff's Office said to CNN. Reports suggest that almost the entire park and its 50 mobile homes were destroyed by the tornado, though the amount of damage done to each home varies, local News On 6 reported. Of the three people confirmed to be injured, two of them are in critical condition. The tornado eventually moved through Tulsa, forcing a children’s gymnasium to collapse with 60 people inside. News On 6 journalist Brandi Ball said everyone inside the gym was safe after firefighters rescued them from the building. No other injuries have been reported in the city. Meanwhile, a second tornado touched down in Moore, near Oklahoma City. Some buildings were damaged and a radio tower fell over, but injuries have yet to be confirmed. About 36,000 power outages have also been reported in the central part of the state, according to Oklahoma Gas & Electric. Oklahoma City has been most affected, with some 18,500 outages as of 10:30 p.m. Eastern Time. A severe thunderstorm watch is in effect until late Wednesday. Hail the size of golf balls has also been reported, falling in parts of the state alongside heavy rain. Another tornado was reported in northwest Arkansas, but no injures have been confirmed.